Gary Ross’ Ocean’s 8 is not quite a remake, not quite a reboot, and not an especially good movie. The prevailing sentiment is one of irritable obligation in the kind of paradoxical effort that’s both relentlessly self-promotional and woefully insecure. This extension of the Ocean’s Extended Universe™ finds Debbie Ocean (Sandra Bullock) out of prison and ready to enlist a cadre of skilled women in hopes of a obtaining a diamond necklace. Staging the heist during the Met Gala, the centerpiece caper promises all the stylistic extravagance that made Steven Soderbergh’s 2001 film such a delight. Ross, however, lazily operates within the confines of Soderbergh’s shadow, unable and unwilling to provoke anything meaningful out of anyone involved. The result is a barren rethread, a thoroughly bland film committed to dispensing blasé platitudes and charmless lallations. Never has a film starring the likes of Cate Blanchett, Helena Bonham Carter, or Sarah Paulson been this innocuous and dull. The parallels being drawn between Stephanie Meyer’s Twilight series and Suzanne Collins’ Hunger Games trilogy strike me as being purposefully ignorant of the material itself, only acknowledging the demographic that they apparently reach (which may overlap, but Collins’ work seems to tap to a larger zeitgeist that disregards gender lines). But having seen all the Twilight films (and enduring the first novel) and catching up with Gary Ross’ The Hunger Games last night, it’s obvious that those slighting Collins’ narrative by comparing it with Meyer’s work don’t know what the hell they are talking about. The dystopian world at the heart of Suzanne Collins’ work delves significantly deeper into a concise socioeconomical critique of contemporary society. The various outliers, whether it is the poverty stricken lower districts or the pompously excessive wealth of the capitol, all serve to underscore a narrative that keenly observes our own contemporary society in an extreme direction. While the film only makes fleeting attempts to explain how a system of extreme poverty and competitive murder would be accepted (which ends up being the picture’s greatest misstep), Ross still manages to navigate his way through the patchy logic by continuously moving the picture forward. While Ross’ direction lacks finesse, he adopts a sense of perpetual narrative propulsion, wherein he manages to maintain tension for prolonged periods of time. 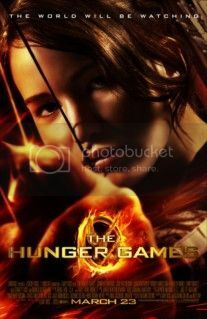 But the most crucial aspect to The Hunger Games’ success stems from the excellent casting of Jennifer Lawrence in the lead role. She’s a towering presence that balances the picture’s demand for gritty physicality and raw sexuality. It’s a role that bares some striking similarities to Saoirse Ronan character in last year’s Hanna. But while Hanna operated under the mentality that its main character was devoid of a sense of sexuality, The Hunger Games depends on its lead’s sexuality to progress its narrative, even if it comes from a reluctant place. And in a particularly novel direction, there’s a public eye that demands to view this blossoming heterosexual relationship for their pleasure. The social structure, politics, voyeurism, and thirst for violence are all presented in a matter-of-fact way. Herein leads to a fairly problematic issue I have with the picture, as there’s little effort to establish what propagated the system in the first place. The absence of these details, and the general acceptance of it by virtually everyone we encounter, whether it’s members of the capitol or the poverty-stricken, strikes me as lazy writing. Still, that thought only entered my head after The Hunger Games was over, as the film’s sense of constant movement is absorbing enough to distract you from all its narrative holes.